Sean Penn. Samantha Morton. Uma Thurman. Anthony Lapaglia. Brian Markinson. Gretchen Mol. Tye Sheridan. David Koechner. Halston Sage. 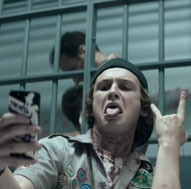 Logan Miller. Patrick Schwarzenegger . Joey Morgan. Sarah Dumont. Christopher Landon . Woody Allen. Action/Adventure. Romance. Zombies. Comedy. Horror. Comedy. Drama. Recommended.